Exactly the same product as you would buy in the UK. 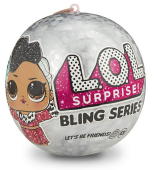 We constantly check for LOL Surprise Bling Series stock, so you don't have to. Receive email alerts when LOL Surprise Bling Series online stock is found.